Yes, it is that time again. Christmas is coming. Even though some individuals may not be thinking about Christmas just yet, most companies will be in full Christmas planning mode by now. 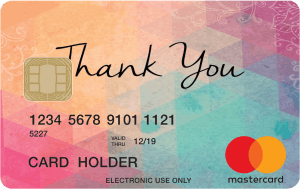 Mastercard gift cards, Visa gift cards and eftpos gift cards are the most popular choice. More companies are choosing these prepaid gift cards as a preferred alternative to merchandise or store gift cards. Store gift cards are limiting, as the recipient must only use the card within that store. With a Mastercard, Visa or eftpos gift card, they can shop where ever these cards are accepted. The cards have more cut-through and are far more memorable than cash. Cash gets lost in every day spend and is easily forgotten. Perfect for the well-planned executive and last minute shoppers alike, the ordering process is a piece of cake. Although if you want to personalise the cards, you do need to get in early. As a matter of fact, if you would like to design your own cards, you need to get your order in by mid-late October at the latest. If you miss this deadline, you can always choose from one of the many glittery, sparkly generic Christmas designs on offer, which are just as loved. Corporate Prepaid Gift Cards offers a broad range of generic Mastercard gift cards, Visa gift cards and eftpos gift cards. If you select to brand them with your own logo or company design artwork, they will have maximum impact in terms of customer brand recognition. They are ideal for staff who will get that warm fuzzy feeling when buying themselves something special and remembering your kind gesture. Companies choose them for many reasons but mainly because they are so convenient that you can finish your entire Christmas list in one day. Suitable to pretty much anyone who likes to spend money on whatever they like! If you are thinking of running a Christmas promotion, look no further than a prepaid gift card as a prize. You could offer one grand card prize with a larger amount or several smaller ones if you would like more winners. Once again you can choose a generic card or brand them as you wish. Prepaid gift cards are also gaining popularity for other gifting occasions, including birthdays, thank you’s, staff tenure, and reward and recognition programs. Load them one time, or as many times as you like. Choose the card that works for you. The cards can come as singleload, which is a card which is loaded once and thrown away once the money is spent. The alternative is a reloadable product which can be loaded with funds as many times as you wish. The reloadable cards are also becoming popular as expense cards, replacing petty cash. They are great for staff members who may not be eligible for a company credit card. Corporate Prepaid Gift Cards give you the option of magstripe (swipe and shop) or contactless (Tap and Go), depending on the card you choose. Corporate Prepaid Gift Cards are part of Zenith Payments, a 100% Australian owned company. Their office is located on the lovely shores of Balmain, Sydney. They are there to help you with any questions you may have via their chat service online, via email or on the phone. Visit our home page or call 1300 128 219.